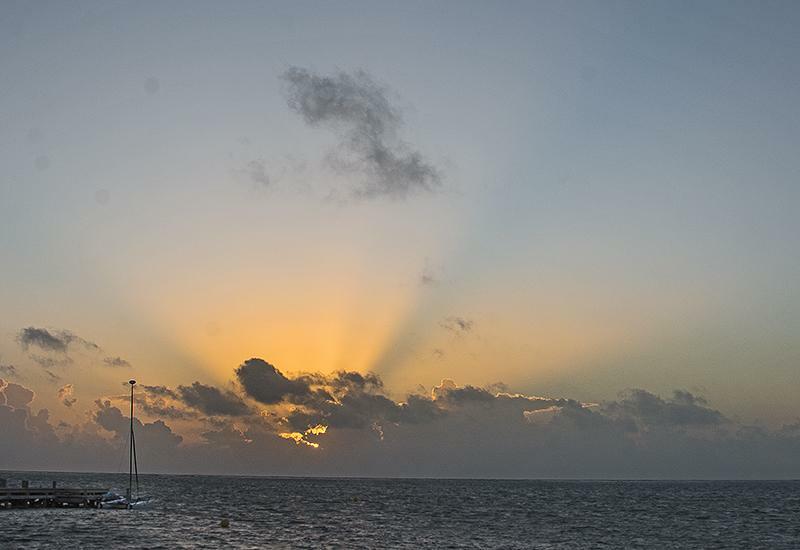 Belize NMS: Fair and mostly dry conditions prevailing. 24-hour forecast: Sunny with a few cloudy spells today and cloudy at times tonight. A few passing showers will affect the coast this morning and tonight. Showers will be isolated eleswhere. Today: Winds: E'ly 10-20 kt. ; seas: Choppy-moderate. ; waves: 3-6 ft.; a few passing showers, north and central. Tomorrow: Winds: E-NE 5-15 kts. ; seas: Choppy. ; waves: 2-4 ft.; a few passing showers, south. Marine Outlook: Tuesday night:- Winds: NE'ly 5-15 kt. ; seas: Choppy. ; waves: 3-5 ft.; isolated showers. General Outlook: A few passing showers will affect southern, coastal areas Tuesday morning. Showers will be isolated elsewhere. On Ambergris Caye this morning we have 100% chance of Nice Day. The expected high is 82f, the sea is calm and sky clear. 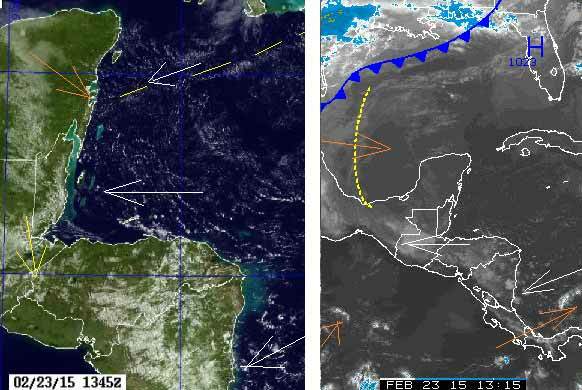 Strong Caribbean winds predominating, sunny but with significant clouds, some hevy clouds and the possibility of some rain showers. Cloud forming as the largely dry Caribbean winds cross over on to land. The Pacific winds coming over northern Mexico are curling round and actually coming over Belize from the NW, but with only very small patches of occasional cloud, some moved from PG southwards. It may be helping the next cold front come down over the Gulf, with cool air in front of it, which might have a little effect on our weather tonight. Today will be rather like yesterday, a fair bit of sunshine, but with a lot of clouds, some small, some larger, the possibility of small rain showers. But less so later in the day.